Foxconn, the Taiwanese manufacturing giant behind Apple’s iPhone and numerous other major electronics devices, aims to automate away a vast majority of its human employees, according to a report from DigiTimes. Dai Jia-peng, the general manager of Foxconn’s automation committee, says the company has a three-phase plan in place to automate its Chinese factories using software and in-house robotics units, known as Foxbots. The first phase of Foxconn’s automation plans involve replacing the work that is either dangerous or involves repetitious labor humans are unwilling to do. The second phase involves improving efficiency by streamlining production lines to reduce the number of excess robots in use. The third and final phase involves automating entire factories, “with only a minimal number of workers assigned for production, logistics, testing, and inspection processes,” according to Jia-peng. The slow and steady march of manufacturing automation has been in place at Foxconn for years. The company said last year that it had set a benchmark of 30 percent automation at its Chinese factories by 2020. The company can now produce around 10,000 Foxbots a year, Jia-peng says, all of which can be used to replace human labor. In March, Foxconn said it had automated away 60,000 jobs at one of its factories. In the long term, robots are more cost effective than human labor. However, the initial investment can be costly. It’s also difficult, expensive, and time consuming to program robots to perform multiple tasks, or to reprogram a robot to perform tasks outside its original function. That is why, in labor markets like China, human workers have thus far been cheaper than robots. The Chinese government has also incentivized human employment. In the areas like Chengdu, Shenzhen, and Zhengzhou, local governments have doled out billions of dollars in bonuses, energy contracts, and public infrastructure to Foxconn to allow the company to expand. 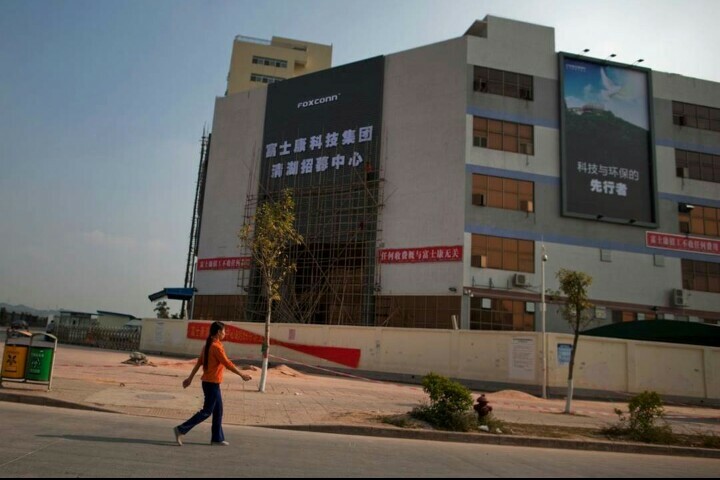 As of last year, Foxconn employed as many as 1.2 million people, making it one of the largest employers in the world. More than 1 million of those workers reside in China, often at elaborate, city-like campuses that house and feed employees. In an in-depth report published yesterday, The New York Times detailed these government incentivizes for Foxconn’s Zhengzhou factory, its largest and most capable plant that produces 500,000 iPhones a day and is known locally as “iPhone City.” According to Foxconn’s Jia-peng, the Zhengzhou factory has some production lines already at the second automation phase and on track to become fully automated in a few years’ time. So it may not be long before one of China’s largest employers will be forced to grapple with its automation ambitions and the benefits it receives to transform rural parts of the country into industrial powerhouses. There is, however, a central side effect to automation that would specifically benefit a company like Foxconn. The manufacturer has been plagued by its sometimes abysmal worker conditions and a high rate of employee suicide. So much so in fact that Foxconn had to install suicide netting at factories throughout China and take measures to protect itself against employee litigation. By replacing humans with robots, Foxconn would relieve itself of any issues stemming from its treatment of workers without having to actually improve living and working conditions or increase wages. But in doing so, it will ultimately end up putting hundreds of thousands, if not millions, of people out of work.